Popoola A. O 1,Popoola O.E2., Igbokwe, O.G1, Olatunde-Aremu F.S3. 2Department of Chemical Science, Yaba College of Technology, Yaba, Nigeria. Clays are used widely for cosmetics and pharmaceutical purposes because of their physical properties and chemical components. In addition, they contain some heavy metals which are significant toxicants and carcinogens. In this study, 8 Nigerian clays from 2 communities in Abia State, Southeastern Nigeria, were analysed for their heavy metal content. The samples were digested using aqua regia (HNO3 and HCl). Cu, Co, Pb, Cd, and Zn were determined in the digested samples using atomic absorption spectrophotometer, Perkin Elmer Analyst 200. The physicochemical properties of the clays such as pH, EC and CEC were also investigated. The concentration of Zn ranged from 14.42 to 41.28mg/kg; Cd ranged 0.06 to 0.11mg/kg as it was detected in only three out of the eight samples. Pb was detected in only one of the samples (4.92mg/kg); Co range from 0.02 to 0.5mg/kg; Cu showed the highest concentration (80.66 to 683.34mg/kg). The CEC of the clay samples were also determined (Na+, K+, Mg2+, Ca2+) and were found to be low in the range of 0.038 to 2.558meq/100g. The pH ranged from 6.58 to 8.08 while EC ranged from 1.41 to 2310 µs/cm. The use for cosmetics and pharmaceuticals of the clay samples that contains Pb and Cd should be discouraged since they represent important exposure source to these carcinogens. The use of clay minerals for cosmetic and curative purposes is almost as old as mankind itself. Clay minerals served in the past to combat several gastrointestinal epidemics, several cutaneous infections, poisoning and even, they had been used for the mummification of Pharaohs. At present, clay minerals are used for therapeutic purposes in pharmaceutical formulations, spas and aesthetic medicine. In pharmaceutical formulations, Smectites, Polygorskite, kaolinite and talc act as active principles or as excipients mainly due to their high specific area and their absorption/adsorption capacity, rheology, chemical inertness and low or no toxicity for the patient. It is generally known that the major constituent of powder and facial masks used by women is talc, a type of clay mineral. Clay is a general term including many combinations of one or more clay minerals with traces of metal oxides and organic matter. It is found in the earth’s crust, distance extending from twelve to hundred meters (12 to 100m). Many of these clays have been known to contain heavy metals because they are sourced from in the soil. Various types of clays with different chemical components (impurities such as heavy metals) have been discovered in Nigeria (Irabor, 2002). Heavy metals are metallic elements which have a high atomic weight and a density much greater (at least 5 times) than water. In small quantities, certain heavy metals (such as Zn, Co) are nutritionally essential for a healthy life as the building blocks of our bodies. They are required for body structure, fluid balance, protein structures and to produce hormones. They act as co-factors, catalysts or inhibitors of all enzymes in the body. Copper and iron, for example, along with other minerals are required for the electron transport system and thus needed for all cellular energy production (Lawrence, 2012). Some heavy metals are however significant toxicants and carcinogens. The International agency for Research on Cancer listed Arsenic (As), cadmium (Cd), chromium (Cr), lead (Pb) and nickel (Ni) as category 1 heavy metal carcinogens (IARC, 2012). Heavy metal gets into the body through direct exposure either by ingestion or dermal absorption where they remain for long periods since they are not biodegradable (Viana et al, 2010). They stimulate changes in cell functions causing disruption of intracellular processes through several mechanisms (Stavrides, 2006). These metallic substances such as Pb and Cd induce oxidative stress, DNA damage, and cell death processes, resulting in increase in the risk of cancer and cancer-related diseases. (Kim et al, 2015). Food is one of the major sources of heavy metal exposure; the others are air (mainly lead dust originating from petrol) and drinking water. Another important exposure source, though often overlooked is ingestion and absorption of clay. The consumption of clay, known as geophagy has been a tradition in many cultures in different parts of the world. It is prevalent in some parts of Africa especially in Ghana (Tayie and Lartey ,1999), Kenya(Geissler et al., 1998), Nigeria (Izugbara, 2003) South Africa and Swaziland (Ngole et al.,) usually by pregnant women for several reasons. Although toxicity and the resulting threat to human health of any contaminant are, of course, a function of concentration, it is well-known that chronic exposure to heavy metals and metalloids at relatively low levels can cause adverse effects (Castro-González & Méndez-Armenta, 2008). Like many other contaminants, lead is ubiquitous and can be found occurring as metallic lead, inorganic ions and salts (Harrison, 2001). Lead has no essential function in man. Children are particularly sensitive to Pb because of their more rapid growth rate and metabolism, with critical effects in the developing nervous system (Castro-González & Méndez-Armenta, 2008). Cadmium apart from being carcinogenic affects negatively several organs in the body: liver, kidney, lung, bones, placenta, brain and the central nervous system (Castro-González & Méndez-Armenta, 2008). Worldwide, clays are being employed for the treatment of various ailments such as skin diseases, diarrhea, etc. In spas and aesthetic medicine, geotherapy, pelotherapy and paramuds, smectite and kaolinite are the mostly used clay minerals. Favourable properties for those purposes are fundamentally represented by absorption/adsorption capacity, cation exchange capacity, plastic properties, rheology, grain size and cooling index. They are used in spas to treat dermatological diseases and to alleviate the pain of chronic rheumatic inflammations. In aesthetic medicine they are used as cosmetic products in order to clean and moisturize the skin, as well as to treat acne, cellulite and to combat compact lip dystrophies, (Carretero, 2002). In Nigeria there are many types of clays found in various parts of the country. Some of these clays have been locally used to paint houses, mold bricks etc. However, through studies other uses of clays such as in mining, refractories, cosmetics, pharmaceuticals, etc., have been discovered. There are abundant clays of different deposits in Nigeria and clays of different deposits often differ (Akinbode, 1996). One of those important deposits is found in Ebonyi State, Southeastern Nigeria, where tiro, a local facial powder used as facial mask by women in Nigeria, is mined. From studies, it is known that the most common type of clay in Nigeria is kaolin. It is also known as China clay. There are other types of clays that are very important. An example is the Bentonitic clay found in Bida Basin, Niger State, Nigeria which is used as driving mud in oil exploration. Some of these clays are applied topically to the face and skin, in treating various skin ailments as well as ingested to cure many ailments. The objective of study is the assessment of carcinogenic heavy metals in clays from some communities in South- East, Nigeria used for cosmetic and pharmaceutical purposes. The study was carried out at different clay deposits in Otampa and Umuasua, Isuikwuato of L.G.A., Abia State. Abia State is located in the southeastern Nigeria geographical grid on N 5o32.00' E 7o53.00' while Otampa is located on (N5047.00', E70.32.00) and Umuasua is located on N 5o42.98' E 7o 30.24'. The region has a tropical climate characterized by rainfall in the rainy season April to October and in the dry season October to May. Eight clay samples were collected from different locations from two communities. Hand trowel was used to scoop the samples into plastic containers and they were taken to the laboratory for analysis. The samples were air-dried and grinded using a mortar and sieved with a 2mm mesh size. pH value was determined using a pH meter as described by Jackson (1967). For this 5g of sieved soil sample was mixed with 10ml distilled water in 1:2 ratio. The suspension was stirred intermittently with glass rod for 30minutes and was left for one hour. The combine electrode was inserted into supernatant and pH was recorded. This was determined on a digital electrical conductivity for which 5g of sieved sample was weighed and mixed with 20ml of distilled water(1:4) and stirred intermittently with glass rod for 30 minutes and was allow to settle down and then the conductivity cell was inserted in solution to take the reading. About 5g of clay soil sample was weighed into a clean porcelain crucible and heated over a hot plate to carefully burn the sample. The residue was then heated in a muffle furnace at 550oC until the carbon content (organic matter) was carefully and completely oxidized (about 1 hour). The residue left was dissolved in a few drops of aqua regia (3 parts concentrated HCl + 1 part concentrated HNO3) and then diluted with distilled water. The solution was then filtered, rinsed very well and the filterate made up to 100ml in a standard volumetric flask. The resulting solution from digestion was then aspirated into the flame of the atomic absorption spectrophotometer (AAS), Parken Elmer Analyst 200 using air acetylene flame for the metal analysis against standard metal solutions. Each metal was determined using specific hollow cathode lamp at a specific wavelength. Total metal concentrations of heavy metals such as Co, Cu, Cd, Pb and Zn were determined. The QA/QC carried out was only limited to blanks and replicates. Standard reference material was not available. The same procedure illustrated above for heavy metals digestion was also used for cation exchange capacity and the cations Na+, K+, Mg2+, Ca2+ were determined using UV spectrophotometer. 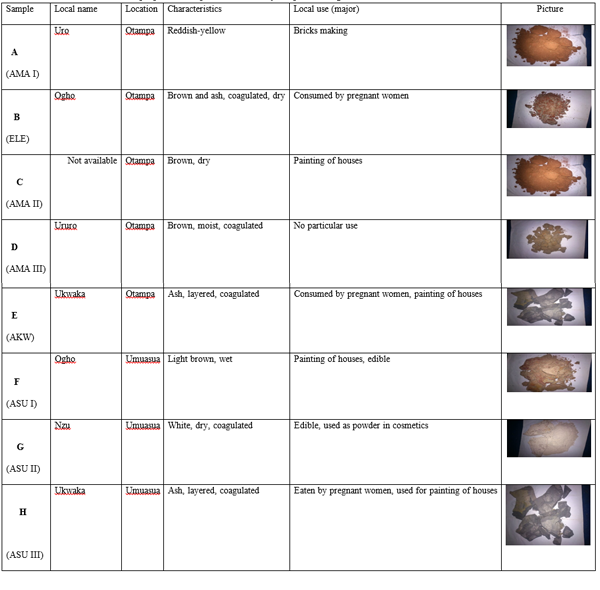 The physical appearance, location and source of the clay samples from two communities in Abia State, Nigeria are shown in Table 1. The pH, Electrical Conductivity (µs/cm) and the Cation Exchange Capacity, CEC (meg/100g) were as shown in Table 2 below while the concentrations of heavy metals (mg/kg) in the clay samples from two communities in Abia State, Nigeria are shown in Table 3. Table 2: Values showing the pH, EC and CEC of clay samples. Table 3 shows the concentrations of Cd, Co, Cu, Pb, and Zn (mean ± standard deviation) determined in the clay samples analyzed to be respectively, 0.027 ± 0.042, 0.189 ± 0.185, 432.54 ± 210.88, 0.615 ± 1.739, and 25.373 ± 9.554 in milligrams per kilogram of clay (dry weight). Analysis of variance one-way (ANOVA) test used to assess which metal concentration differed significantly from each other showed that there is statistically significant difference between the metal concentration groups (P>F =0.001). At least a pair of the mean metal concentration is significantly different from the other group mean (P<0.001). Turkey posthoc pairwise comparisons of means with equal variances showed the metal concentration was significantly higher in the pair group Cu vs Cd (p<0.001), Cu vs Co (p<0.001), Pb vs Cu (p<0.001) and Zn vs Cu (p<0.001). Pearson bivariate correlation analysis applied to assess whether there are associations between each pair of metals regardless of clay sample showed that strong positive correlation was observed between zinc and copper (r=0.767; p=0.026). While no significant or weak positive correlation was found between copper and cobalt (r=0.374; p>0.05), cadmium and cobalt (r=0.345; p>0.05). Negative/inverse or not significant correlation was observed between lead and cobalt(r=-0.216; p>0.05), cadmium and copper (r=-0.169; p>0.05) and also between lead and copper (r=-0.674; p>0.05). The pH (Table 2) of the analyzed clay samples ranged from 6.58-7.99 while the electrical conductivity, EC ranged from 1.41-2310(µs/cm). The pH shows that some of the clays are near neutral and slightly alkaline. The pH of the clay samples could also influence their abilities to beautify the skin (Matike et al., 2011). Some of the clayey soils used for body beautification were acidic and within the pH range of the skin, as well as near neutral. The acidic nature of the skin enables it to act as the body’s first defence mechanism against bacteria by creating an unfavourable environment for bacterial growth (Gfatter et al., 1997). Studies conducted on the skin’s pH by Korting et al. (1992) revealed that optimum growth for the bacteria, Propionibacterium acnes (P. acnes), which causes acne was found at pH 6.0 and 6.5; but the growth rate was found to be much lower at a pH of 5.5.This led to the conclusion that minor shifts in skin surface pH from its normal acid range towards alkaline values may be detrimental to the skin (Korting et al., 1992). The cation exchange capacity, CEC for all the samples showed that magnesium has the lowest value. The highest CEC value was observed for potassium in sample C. The CEC of soils is a measure of the ability to bind or hold exchangeable cations. It is the total number of exchange sites of both organic and mineral colloids (Khorshidi and Lu, 2017). The CEC value for Na+ increased from 0.208(meg/100g) in H to 0.650 in A (meg/100g). For K+, it ranged from 0.178 in D to 1.383 in E. For Ca+, it extended from 0.087 (meg/100g) in C to 1.105 (meg/100g) in B while for Mg2+, it increased from 0.038 (meg/100g) in D to 0.180 (meg/100g) in H. However, the CEC values are low when compared to other CEC values of clays used for cosmetics. The higher CEC values enable higher absorption of the chemical elements fixed reversibly in the clay through the skin and it is based on the establishment of ion gradients and on ion exchange reactions. This shows that sample D has the lowest exchangeable cations while H has the highest. In other words, sample D has the lowest clay or organic matter content while H has the highest clay or organic matter content. Clay and organic matter determine a soil’s CEC. However, since Ca2+determines whether it is of the smectite type, it would be assumed that sample B is more of smectite than the others and therefore can be used for cleaning purposes on the skin as used by the communities. Of the five metals investigated, only Pb and Cd have the potential of inducing both non-carcinogenic and carcinogenic risk. Essential metals such as zinc, copper and cobalt are nutritionally useful for metabolism and growth. They also form an integral part of one or more enzymes involved in metabolic or biochemical process in the body. However, high levels of the essential metals can cause serious health problems to consumers (Nkansaha, 2016). The difference in trace metal levels obtained in the studied clay samples (Table 3) is mainly because the clays are not the same. They have different soil types and textures thus elements will be adsorbed differently onto the clay samples. Though they were obtained from the same local government area (communities). This explains why the locals use them for different purposes. They are usually obtained (mined) from the surrounding soils and are thus different from it. The charged sites on soil particles are important for the retention/adsorption of metals. Metallic counterions found on soil types differs because intrinsic negative charges on the surfaces of soil particles varies depending on the soil types, this explains why the quantity(concentration) of individual metals found in the clays differs (Al-Hamdan and Reddy, 2006). The concentration (mg/kg) of Cu, Co, Pb, Cd, and Zn in all the samples showed Cu having the highest concentration 80.66-683.34 mg/kg. This was followed by Zn with14.42-41.28 mg/kg. The concentration of Co was found to be low (0.02-0.50) and Cd was detected in samples B, C and F while Pb was detected in only sample D. Since Pb is a very toxic metal that can cause health related issues, sample D could be harmful for human consumption. European Food Safety Authority (EFSA) has linked exposure to Pb to effects such as neurotoxiicity, carcinogenicity and reproductive failures in humans (Herreros et al., 2008). Also, high concentrations of lead can result in coma, seizure and even death because Pb targets multiple organs in the body due to its systemic toxicity (Mahurpawar, 2015). Cd has been found to disrupt the endocrine especially reproductive hormones thus increasing the risk of ovarian cancer and breast cancer (Kim et al., 2015). Clay samples A,D,E,G and H are safe for consumption while the others can be dangerous even though the concentration of Cd is low. Cadmium is classified as a human carcinogen by the National Institute for Occupational Safety and Health (NIOSH) (Guy et al., 1999). This could be the reason for parents advising their children not to eat some of the clays as observed in one of the communities. Zinc is not basically of toxicological significance, since it is one of the essential nutrients or trace metals needed in the human body and the quantity obtained will not likely cause adverse effect to the consumer. The physicochemical properties and heavy metals concentrations of some clay use as cosmetics and pharmaceuticals obtained from two communities in Abia State, Nigeria were determined. The pH of the samples ranged from 6.58-7.99 which is slightly near neutral and also slightly alkaline. Since alkaline clays tend to cause or enhance acne, samples C-H need to be subjected to treatment when they are to be used on the face. Samples A and B are slightly acidic and fall within the skin’s acidity. Furthermore, the concentration of the heavy metals shows that Pb and Cd, both carcinogenic metals were found in samples D, B, C and F which could make the samples unsafe for use. The use of samples B, C and F is discouraged because Cd can be very toxic even when consumed in small amounts. The use of these clays by adults and children over a long time poses potential health threat due to the likelihood of bioaccumulation. Matike, D. M., Ekosse, G. I., &Ngole, V. M. (2011).Physicochemical Properties of Clayey Soils Used Traditionally for Cosmetics in Eastern Cape, South Africa.International Journal of the PhysicalSciences., 6, 7557 - 7566. Mahurpawar M. (2015) Effects of heavy metals on human health, Int. J. Res.Granthaalayah 1?7. Kim H. S, Kim Y. J, Seo Y. R (2015) An Overview of Carcinogenic Heavy Metal: Molecular Toxicity Mechanism and Prevention, Journal of Cancer Prevention. Vol. 20, No. 4Lawrence, W.M.D. (2012). Toxic Metals, the Center for Development. Retrieved from: . com/articles/TOXIC%20METALS.htm. (Accessed on: October, 2012). IARC monographs on the evaluation of carcinogenic risk to human. Volume 100C. Lyon, International Agency for Research.on Cancer, 2012. Guy, R., J.J. Hostynek, R.S. Hinz and C.R. Lorence (1999): Metals and the Skin: Topical Effects and Systemic Absorption. CRC Press, Marcel Dekker, New York. Akinbode, F.O. (1996): An investigation on the properties of termite hill refractory material for fumace lining; Indian Foundry Journal, 42(9), 10 -13. Korting HC, Lukacs A, Vogt N, Urban J, Ehret W, Ruckdeschel G (1992). Influence of the pH value on the growh of Staphylococcus epidermidis, Staphylococcus aureus and Propionibacterium acnes in continous culture. Zbl. Hyg. 193: 78-90. Tayie, F.A.K and A. Lartey (1999) Pica practice among pregnant Ghanaians: Relationship with infant birth-weight and maternal haemoglobin level. Ghana Medical Journal; 33, 67-76. Velde, B. (1995). Composition and Minerology of clay minerals, in Velde, B. Origin and mineraology of clays: New York, Springerverleg. 8-42. Viana G. F. S., Garcia K.S, Menezes-Filho J.A (2010) Assessment of carcinogenic heavy metal levels in Brazilian cigarettes. Environ Monit Assess DOI 10.1007/s10661-010-1827-3.Available from: [accessed Jun 03 2018].